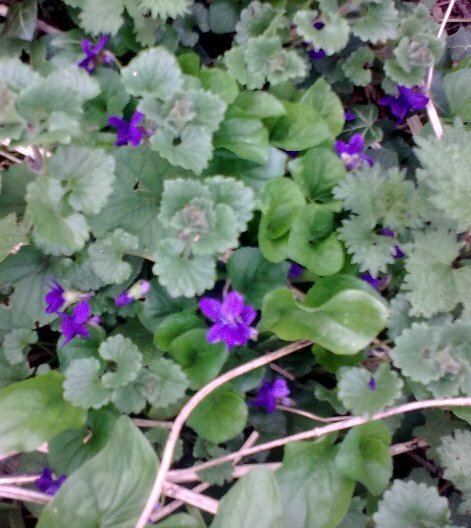 Nick's Nature Notes: Oh my sweet Violet! In the last week ‘Violets’ have started to appear frequently on our local hedgebanks and around our garden at the Pinfold (picture shows Violets amongst other woodland plants). I’ve been having fun trying to identify them, which is not easy from casual observation, and made more challenging by frequent hybridisation and escapes from gardens into the local countryside. In Britain, the Common Dog-violet (Viola riviniana) is the commonest, but these are not easy to distinguish from others such as the Early Dog-violet (V. reichenbachiana) and Hairy violet (V. hirta). Key differences are; pointed or blunt sepals, features of the spurs (hollow projection at rear of petals) and hairiness. However the Sweet Violet (V. odorata) is easier to identify as it is the only fragrant Violet, with its characteristic ‘parma violet’ aroma. The only difficulty is that in trying to avoid picking flowers I have to prostrate myself to these low growing plants and face the embarrassment of being caught with my nose, dog-like to the ground. The fragrance of the Sweet Violet has not escaped the attention of scientists interested in its potential as a natural means to control insect pests. Indeed, used as a plant extract it has been shown to be very effective at repelling pests including the yellow fever mosquito and a malarial carrying insect (*). Other uses of the Sweet Violet’s attractiveness are as a decorative addition to salads, perfumery and to flavour breath fresheners (**). I’ve even seen recipes for; Sweet Violet Syrup, sugared violets, and used in iced tea and champagne. This is my favourite so far! I like the bit where your complaining about looking like a dog sniffing the ground!